Select the card from your hand that you think is best described by a card played by the judge. If the judge picks your card, you win that round. And everyone gets a chance to be the judge! Each round is filled with surprising and outrageous comparisons from a wide range of people, places, things and events. 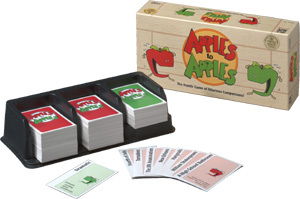 Fast moving and refreshing, APPLES to APPLES is perfect for any get-together with family and friends! This game has quickly become a CLASSIC party/get-together game. It's soo easy to play and you can play with a lot of people. Pick up a couple expansions and you're guaranteed never to have the same game twice. My family loves it! Apples to Apples is a great game. For awhile I didn't order it because I thought it wouldn't be fun. I finally broke down and I regret not getting it sooner. All of my friends and family that I have played it with have really enjoyed it and all of them are ordering their own copies. It is a great party game with lots of laughs. You basically try to match nouns with adjectives. But the problem is that sometimes the nouns in your hand don't fit with the adjectives, but you need to lay a card down. It starts to become quite entertaining to see what nouns are played. This game is a fun ice breaker to get the party started, but it is pretty random in terms of who wins. I have to admit that we laughed pretty hard playing it, but none of us wanted to play it again afterwards. I have a feeling that this is one of those games that you can't play very often, but when you take it out, everyone will have a good time. This is the perfect party game for a big group of people! It is simple and everyone can play! I highly recommend it. My wife and I first played while visiting with a couple friend in another state. We had a blast and bought it not long after getting back home. We've played this many times with other friends, and they all have enjoyed it. This game was fun with the family or with a bigger group. Gave us lots of laughs and though some strategy helps any age can play. We learned a little more about each other. We play this game all the time in a group of friends. doesn't really require any prep time, just pass out cards and go. Fun group game, nice ice breaker sure to be lots of laughs. A classic party game of comparisions. The nice thing about this game is that everyone can play, and you learn something new about people with you play it. Should be in every game closet. Apples to Apples is a fun game and great for parties. Parties are a riot with this game, with sure fun for everyone. A classic party game. You need at least 4, but preferable more people to enjoy this. The base game includes plenty of cards for playing the game many times without repetition. If you game with a wide age range, buy this game. If you enjoy social party games, buy this game. If you're looking for a game for extended families to play together, buy this game! To play, the judge shows a card and then picks out the best submission from all the other players. The judge's rule is final. Rotate judges and repeat. If that doesn't turn you off from the game, BTG! This is a fun party game that's more about knowing your opponents than matching nouns to adjectives. In fact, matching nouns to adjectives would be a pretty poor game and a pretty dull strategy. Lots of silly fun. It's not for serious gamers at all but if you're at a party, it's easy to get everyone involved. Great family game. Anyone can play. Although younger children may have a hard time with the true spirit of the game, they can still pick cards and end up winning anyway! My sister has a learning disability and she still thoroughly enjoys the game when she plays even if her card does not get picked too often. At this point, apples to apples is a classic. One of those universal appeal games that everyone can have fun judging and putting in wacky combination. It's a great icebreaker game because people will learn others' personalities and judging styles as they play! One of the best party games you could ever buy...it'll get gamers and non-gamers alike laughing hysterically! Fun, fun, fun!!! Apples to Apples is a good party game for a group of 5-10 people. The game play is simple and can be played in a relaxed manner. It can be a hilarious and entertaining game for all.